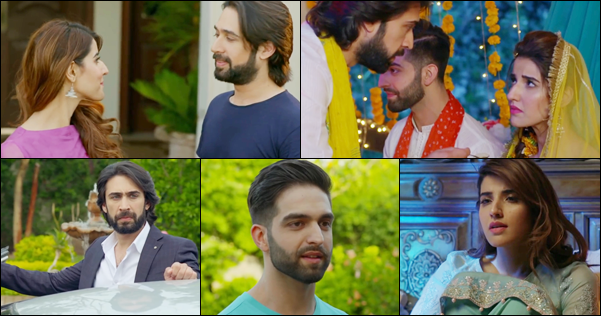 Home » »Unlabelled » Main Khayal Hoon Kisi Aur Ka – The Much Anticipated Drama’s First Episode Is Out! Main Khayal Hoon Kisi Aur Ka – The Much Anticipated Drama’s First Episode Is Out! After doing a phenomenal job on big screen the adorable couple Ali Rehman and Hareem Farooq is back on small screen with a very different and complicated story. The story revolves around two love birds who are head over heels for each other Dania (Hareem Farooq) and Zaryab (Ali Rehman). The lovers daydream to have a lifetime together but it all goes in vain when his brother Armaan (Alamdaar Hussain) fell for Dania at first sight; unaware of the love between his brother and Dania. The dreams crumpled when his mother announces Armaan’s engagement to Dania! Being an adopted child, Zaryab spoke nothing about his love just because he was indebted to the people who brought him up and his brother means a lot to him. The first episode was very happening; the cast was introduced with the story moving in a very fast pace. Hareem Farooq and Ali Rehman looked splendid and did justice to their characters but since Alamdaar Hussain is a newbie so we can expect the improvement in further episodes.